It was the thrill of a lifetime when a group of killer whales headed directly toward the Johnson family sitting in their boat on Dyes Inlet. The screams of delight leave no doubt, as you can see and hear from one of the best orca videos I’ve viewed in quite a while. It was Wednesday evening this week, and the Johnsons had just put their 23-foot runabout in the water for the first time this summer. 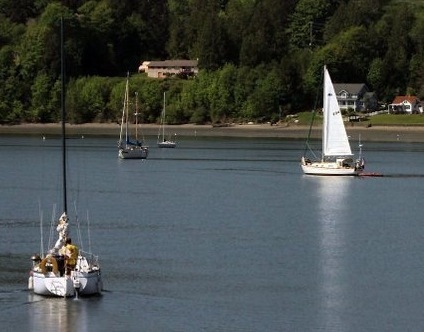 The family lives on Erlands Point in Dyes Inlet, and it seemed like a good idea to drive the boat over to the Bremerton Marina for dinner at Bremerton Bar and Grill, Julie Johnson told me. On the way home, the boat was passing under the Manette Bridge when the group spotted the orcas. Aboard the boat were nine people: Julie and her husband Dr. Jerrold Johnson, their five kids, a nephew and a friend. The boat passed the whales at a safe distance, Julie told me, then the boat slowed to a stop and the motor was turned off. Just before the whales reached the boat, they turned sharply and crossed behind the stern. Interestingly, the couple recently took a cruise in Alaska, thinking they would see killer whales. The only sighting was a group of whales far off in the distance. 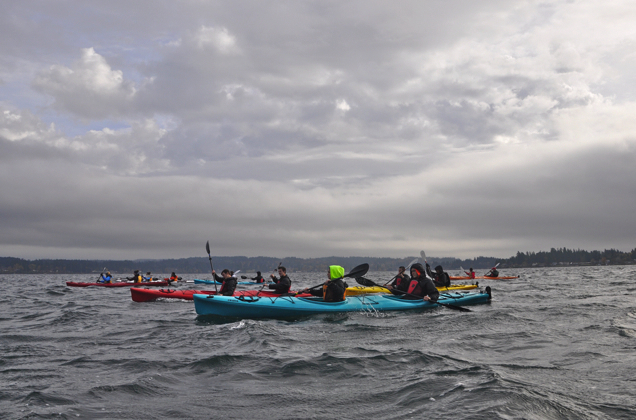 As for Wednesday night, the boats on Dyes Inlet seemed to be keeping a safe distance from the whales, Julie said. On Thursday, reports of boat traffic around the orcas were mixed, and Susan Berta of Orca Network said she received some emails with photos of boats that may have been violating the law. She forwarded the photos to federal law enforcement officers. 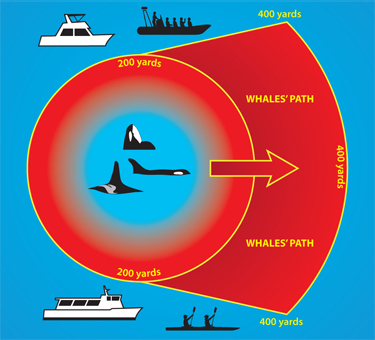 Federal law requires boaters to stay 200 yards to the sides of killer whales and more than 400 yards to the front. When people are watching from shore, it is especially hard to tell how close the boats are to the whales, Susan said. It may look like boats are swarming around the whales when they may be at a safe distance. People who have concerns about boater behavior can file a report directly by filling out a form on the Be Whale Wise website. The form goes to enforcement officers for NOAA Fisheries. One can also call the toll-free hotline, (800) 853-1964. Federal regulations prohibit boat operators from approaching killer whales closer than 200 yards or to position a vessel in the path of a killer whale within 400 yards. A chart explaining the rules (PDF 8 mb) can be downloaded from the Be Whale Wise website. 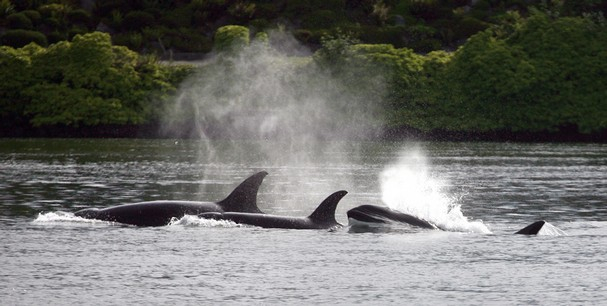 The whales in Dyes Inlet this week were identified as marine-mammal-eating transient killer whales, probably part of a group of 30 to 50 transients spread around Puget Sound and the San Juan Islands starting on Tuesday, the Fourth of July. The orcas in Puget Sound appeared to be at least four different family groups, according to Alisa Lemire Brooks, whale sighting coordinator for Orca Network. At least half a dozen orcas came into Dyes Inlet on Wednesday, she said, including an older female (T-36) and her daughter (T-36-B) plus the offspring of her daughter. Other identifications will probably come later. Yesterday, another group (the T99s) were seen among the whales. 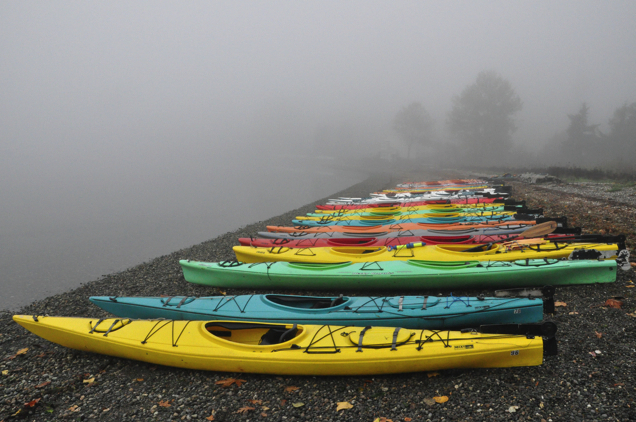 When whales come into Dyes Inlet, good viewing locations from shore include Bremerton’s Lions Park when they are coming in or going out. 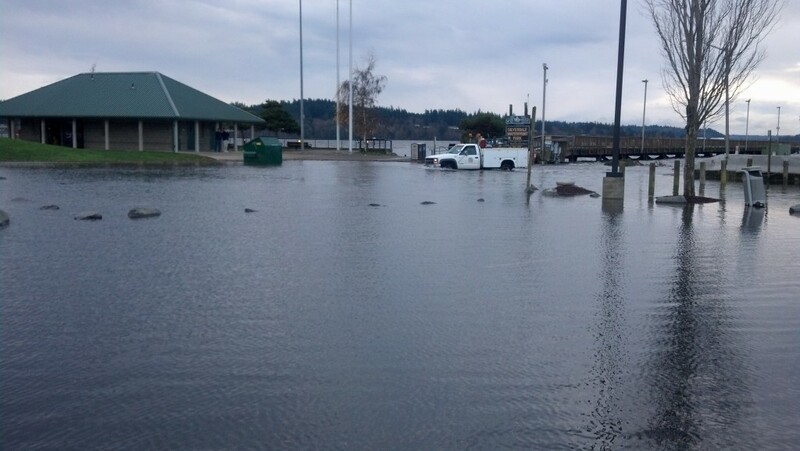 If they stay around, you may be able to spot them from Tracyton or Chico boat launches or from Silverdale Waterfront Park. Embracing a new approach to nonpoint pollution? When it comes to cleaning up bacterial pollution in Puget Sound, we seem to have a clash — or at least some redundancy — in the methods we use. Sailors take advantage of nice weather last week on Liberty Bay. In Kitsap County, water-quality officials are saying studies conducted by the Washington Department of Ecology, which allocated total maximum daily loads (TMDLs), have not been much help in attacking the local pollution problem. 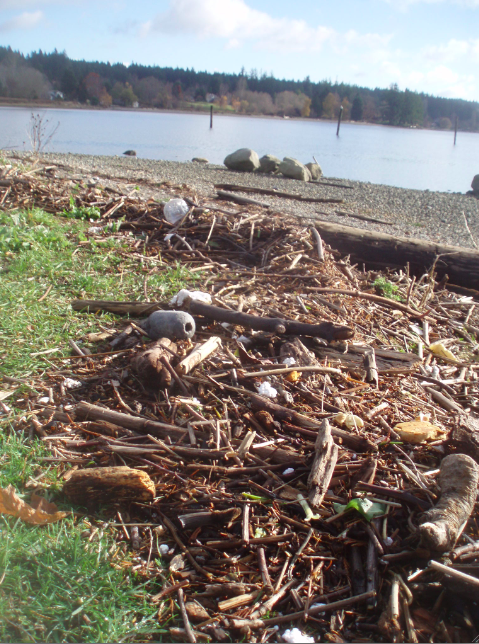 That’s because the approach developed by Kitsap County, called the Pollution Identification and Correction (PIC) Program, has been highly successful in tracking down and cleaning up bacterial pollution. 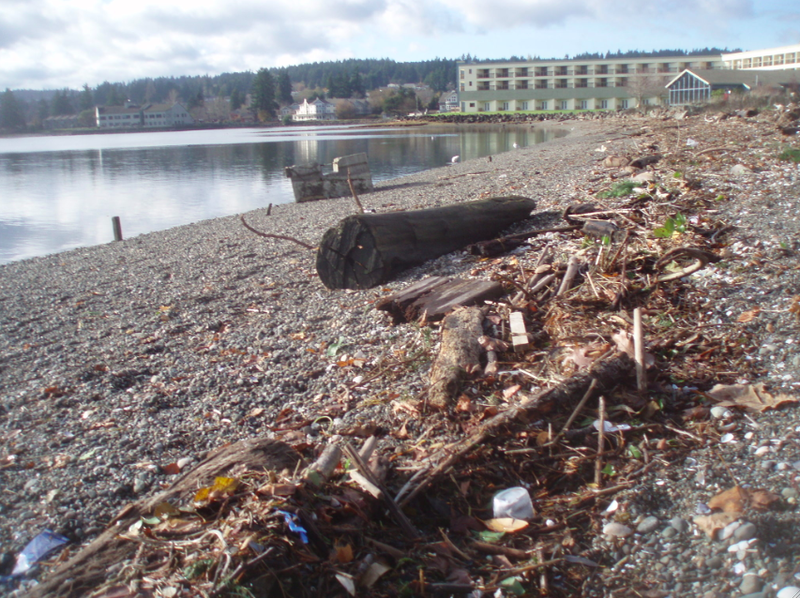 I wrote a story about this issue as it relates to Liberty Bay in yesterday’s Kitsap Sun. I also talked a little about the two water-quality standards used for streams. It’s somewhat odd how Liberty Bay must conform to a stricter standard than nearby Dyes Inlet, since both are in urbanizing areas. By the way, there is only one standard for marine waters, and Liberty Bay is generally clean under that standard. Other information on the Liberty Bay TMDL study can be found on Ecology’s website and in a news release. 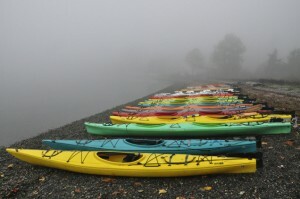 With regard to cleanup methods, now that PIC has been adopted and funded for the Puget Sound region, one might argue that it is time to back away from the more cumbersome TMDL approach, which spends a great deal of money to allocate pollution loads with no guarantees that any cleanup will get done. For recent funding details, review the Washington Department of Health’s Page on “EPA Grant: Pathogens, Prevention, Reduction and Control” and the specific funding for PIC projects. The Southern Resident killer whales have begun their annual travels into Central and South Puget Sound in search of chum salmon. 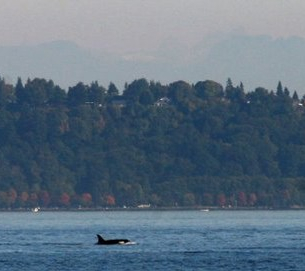 Southern Resident killer whales passed by Bainbridge Island on Monday. The shift occurs when chinook salmon have completed their migration and chum are just beginning to come home to their natal streams, as I describe in a story in yesterday’s Kitsap Sun. It is widely assumed that the length of their stay depends on their success in finding the later salmon. This year was predicted to be a low year for fall chum. But Jay Zischke, marine fisheries manager for the Suquamish Tribe, told me that early commercial and test fisheries suggest that the run is either earlier than usual or larger than the preseason forecast. Even so, it may still be a relatively low year for fall chum. This is the 15th anniversary of another low chum year, 1997, when 19 members of L pod came all the way into Dyes Inlet to find adequate numbers of chum schooled up in front of Chico and Barker creeks. The whales stayed in the inlet for a month and left just before Thanksgiving. There is still debate about whether they wanted to stay that long. 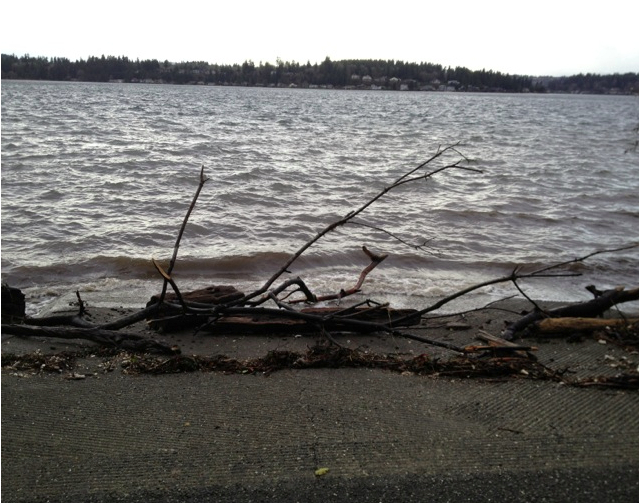 We’ve been writing a lot lately about shoreline restoration projects. As with road construction, it seems that the heaviest lifting on restoration projects gets going as summer draws to a close. The dismantling of 1,500 feet of rock bulkhead from Bainbridge Island’s Port Madison, a project known as the Powel bulkhead removal. 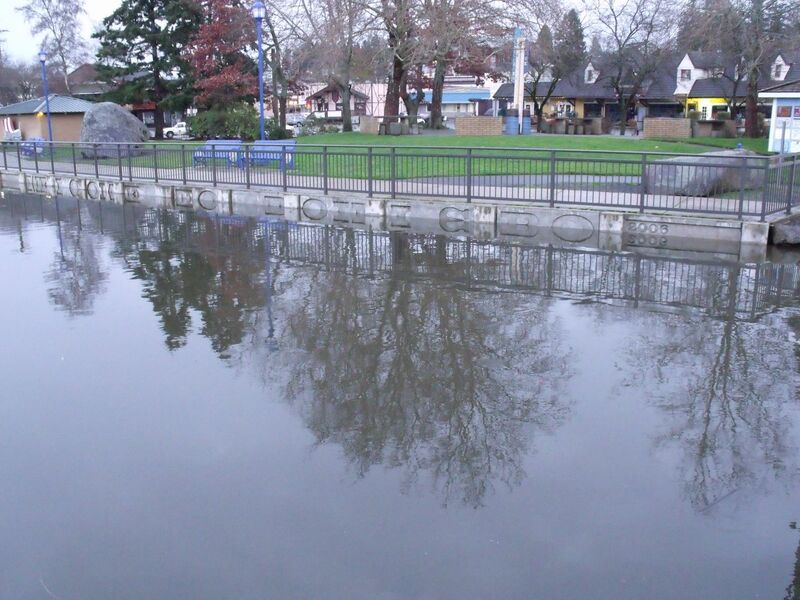 Removal of a 700-foot concrete bulkhead at Anna Smith Children’s Park in Central Kitsap. 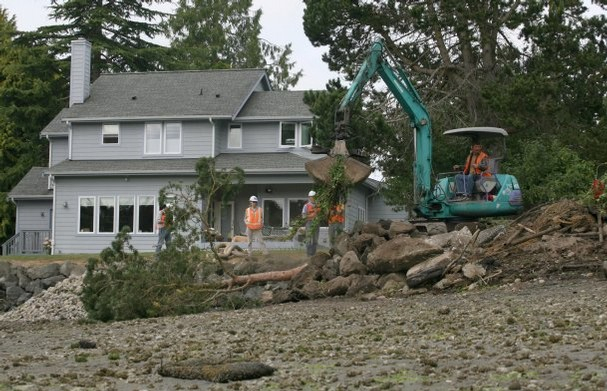 The first phase of a $1.8 million restoration of the Union River estuary, which will include breaching a dike next year to allow sea water to cover about 30 acres walled off for 80 years. Judging from the comments on the stories, some people don’t believe the government should be spending money on environmental restoration when the state and nation are in an economic slump. 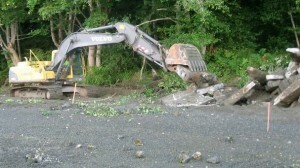 Removing an aging bulkhead on Dyes Inlet is expected to improve nearshore habitat at Anna Smith Children’s Park. She was talking about reducing stormwater pollution by being careful with household and lawn chemicals, car washing, oil and oil leaks, pet waste and other things. When it comes to restoration projects, it turns out that the recession was actually a good time to begin many of these costly projects. As I reported in “Water Ways” on Oct. 21, 2010, the economic stimulus package approved by Congress helped pay for more than 600 projects directed to Puget Sound problems. The projects carried a price tag of about $460 million and created nearly 16,000 jobs. The economic downturn also turned out to be good timing in another way. Construction companies hungry for work offered much lower bids than they would have during economic boom times. In many cases, including the Union River estuary project, bids are still coming in at the low end of cost projections. Property owners who wish to restore their streams and shorelines are getting help from the government and nonprofit groups. In most cases, these projects would not get done by the property owners alone. Some people doubt that the restoration projects are doing much good. Some say they simply are not worth the cost. 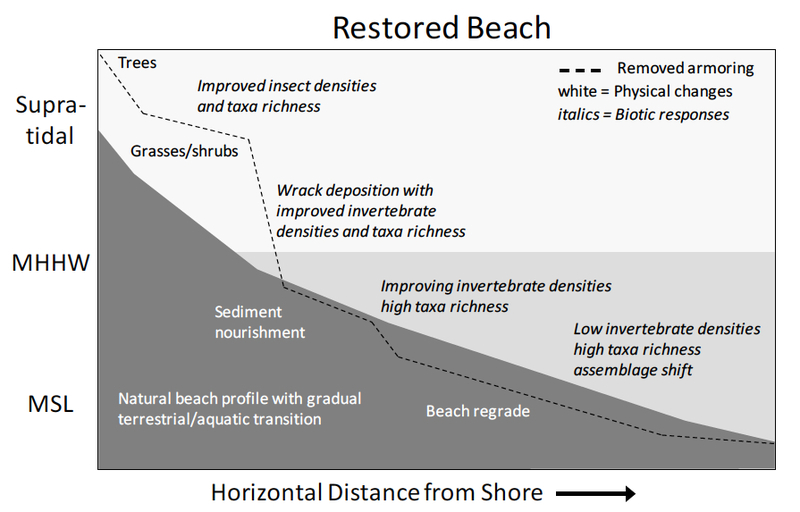 But experts who have studied nearshore ecosystems argue that the ecological connections along the shoreline have been so severely disrupted that restoration is the best hope of saving the Puget Sound ecosystem. I’ve heard people say that science does not support these kinds of restoration efforts. That’s an opinion not held by most experts, but if you are willing to do some reading, you can come to your own conclusions. Some of the leading experts in our region have been taking part in the Puget Sound Nearshore Ecosystem Restoration Project, which includes a website of technical reports and plans. If you’re a fan of science, like me, you may feel like a kid in a candy shop as you peruse the many reports. The pair of explanatory drawings below is taken from a chapter of the “State of the Science” report mentioned above. 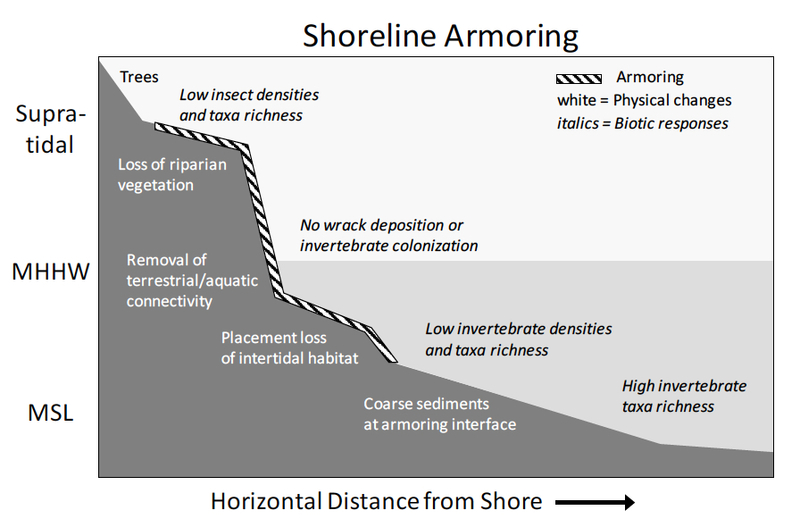 See Fish and Invertebrate Response to Shoreline Armoring and Restoration in Puget Sound (PDF 440 KB) by Jason D. Toft, Jeffery R. Cordell, Sarah M. Heerhartz, Elizabeth A. Armbrust, and Charles A. Simenstad. The soon-to-be-released cleanup plan for Sinclair and Dyes inlets could become a leading example of how to reduce all kinds of pollution in a waterway. Check out my story in Tuesday’s Kitsap Sun. Based on conversations with many people involved in the project, I believe the keys to success are continual and ongoing monitoring of water quality, an unfailing commitment to identify pollution sources, and a spirit of cooperation with people who can help solve the problems. Officials with the Kitsap County Health District and other local and state agencies will tell you that one can never walk away from a watershed with the belief that the pollution problem is solved. Still, at times, the rewards can be relatively quick, as one observes improvements in water quality after a pollution source is turned off. Every month for the past 15 years, health district officials have gone out into the field and taken water samples from nearly every stream in Kitsap County — some 58 streams at last count. Often, these monthly tests provide assurance than cleanup plans are working. Occasionally, they offer an early warning that someone in the watershed is doing something to degrade water quality. Monthly water-quality testing over time tells a story about differences between wet years and dry years, about the effects of new development, and about successes that follow cleanup of problem farms, septic systems or yards containing dog feces. I think it would be a big step forward if every significant stream in the state were monitored monthly for at least bacterial pollution. The results would help all levels of government set priorities for dealing with stormwater and other pollution sources. Another factor worth mentioning in regard to the Sinclair-Dyes cleanup is the Navy’s funding for Project Envvest, a cooperative effort between the U.S. Environmental Protection Agency, Washington Department of Ecology and the Navy. The resulting computer model helped describe the flow of pollution under various rainfall scenarios. It can even predict the movement of pollution resulting from various kinds of spills. The animation (right) shows what would happen if the ultraviolet infection system were to fail in the East Bremerton treatment plant, which handles stormwater mixed with sewage during periods of heavy rainfall. Tidal flows make a big difference. This simulated spill is 7,000 gallons per minute for a total of 10 million gallons. See CSO Simulation Scenarios to view other animations from the model.